Michael “The Count” Bisping (28-7) upset the odds and fullfilled his destiny when he beat Luke Rockhold at UFC 199 to become the UFC world middleweight champion. Having been in the game for over 10 years, losing three title eliminators that title shot seemed elusive for the Brition. Luke Rockhold (15-3) was originally scheduled to face Chris Weidman, but injury forced him out of the bout. The 37-year-old Briton, who was given only 17 days notice to prepare for his first title shot took his opportunity with both hands. Most MMA fans thought that Bisping would be up against it, facing the then champ Luke Rockhold who had gone into the contest on a run of five successive victories, including a second-round submission win against Bisping in November 2014. However, Bisping had been telling us in the run-up to this fight at press conferences that it was his destiny to become UFC champion and he believed this was his time. ‘The Count’ became the first Briton to win a UFC title with a sensational first-round knockout against middleweight champion Luke Rockhold in Los Angeles. Bisping wasted no time and went straight after the American in his quest to become champion, after a couple of early exchanges Bisping floored Rockhold with a left hook. Another left saw the American down again moments later and following a flurry of devastating head and body shots, the fight was stopped after just three minutes, 36 seconds at the Forum. Luke Rockhold was caught out by the speed of the Briton’s glancing left hook and suffered only the third defeat of his UFC career. Bisping said after the fight. “I am so happy right now. I started fighting when I came out of my mother’s womb. I really have always been a fighter. It’s gotten me in trouble, but there’s nothing I did better in life than fighting. “I am an average guy. This is my dream. Nobody was taking this away from me. Two weeks’ notice, two days, two hours, two minutes, I’ll fight anyone anywhere, it’s amazing,” Bisping said. It completed a remarkable resurgence for Bisping, who has lost three title eliminators in his 10 years in the sport. In the co-main event, bantamweight champion Dominick Cruz solidified his superiority over the only man to beat him in a cage, taking a lopsided unanimous decision over former WEC featherweight titleholder Urijah Faber. Judges saw the contest 50-45 twice and 49-46 for Cruz, the fleet-footed sharpshooter whose trademark blend of striking and grappling has propelled him to a 22-1 record in MMA despite more than one knee reconstruction surgery. 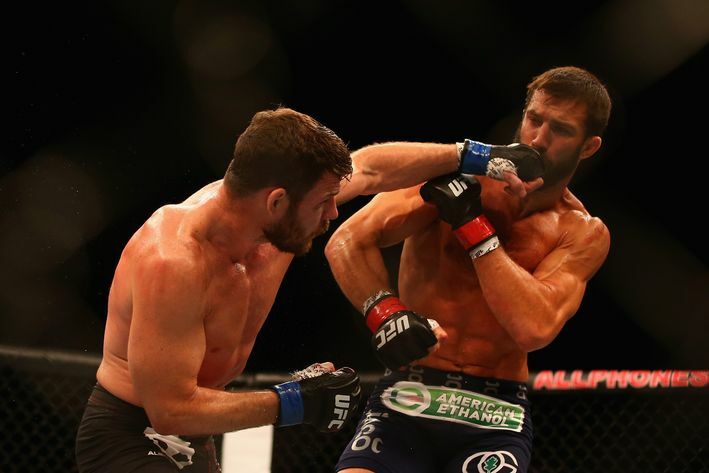 Great knockout by Bisping, caught Rockhold cold!